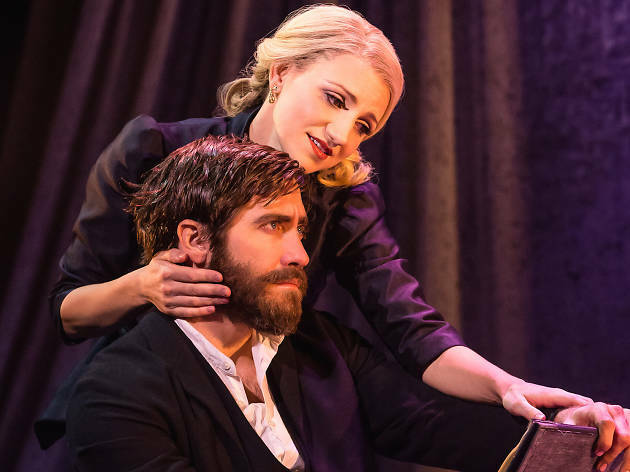 Last October, when it played New York City Center for a mere three days, the Jake Gyllenhaal–led Sunday in the Park with George left no time for the paint to dry. It was here, it was gone, and nothing was left but bragging rights. And you had to forgive the braggers. The energy of a limited run is unique and galvanizing; unconstrained by complex blocking or much of a set, actors are freer to play around. Vocally, they may be more inclined to reach further, take bigger risks. Who knows when they’ll get another chance to do the role? How about now? 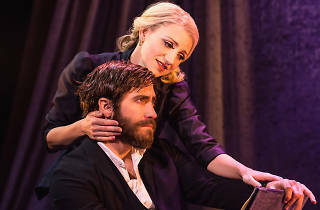 Several of the cast members are back for the Broadway remounting at the refurbished Hudson Theatre, including, most importantly, Gyllenhaal as French Pointillist painter Georges Seurat and the kittenishly sweet Annaleigh Ashford as his model, lover and muse, Dot. They are well supported by a chamber orchestra under the sensitive baton of Chris Fenwick, so Stephen Sondheim’s plangent, soaring score sounds marvelous. If Sarna Lapine’s budget staging reminds you that this version began as a concert, at least you can get lost in the music. And bravo for the “Chromolume” FX in the second act, much more artful and dazzling than in most revivals: Designers Tal Yarden and Christopher Ash dip scores of strobing, colored bulbs over the audience’s head, creating a pulsing, three-dimensional field of points—cleverly translating the first act’s painterly technique to modern technology. There aren’t many Sunday revivals where you leave humming the Chromolume. As far as human effects, you will be suitably swept away by Gyllenhaal’s passionately acted, exquisitely articulated George, the most psychologically cohesive and sympathetic rendition I’ve witnessed live. (Mandy Patinkin on video will always remain the gold standard.) Comical and tender by turns, Ashford provides the flashes of light where Gyllenhaal turns inward to shadow. Now 34 years old, Sondheim and James Lapine’s art-world satire still cuts and its climax still brings tears. It began Sondheim’s late (and, arguably, most unguarded) period, including the daring innovations of In the Woods, Assassins and Passion. Sunday remains a masterpiece that affirms the painful, isolating joys of creation, and the need to learn new lessons. Like a densely plotted canvas, it’s worth seeing, no matter where or how it’s hung. Hudson Theatre (Broadway). Music and lyrics by Stephen Sondheim. Book by James Lapine. Directed by Sarna Lapine. With Jake Gyllenhaal, Annaleigh Ashford. Running time: 2hrs 35mins. One intermission. Through Apr 23. Click here for full ticket and venue information.